Our constant advice was to buy, accumulate, and personally hold physical gold and silver at any price, all throughout the decline from 2011 highs. The fundamentals dictated that strategy for so many reasons, well beyond the demand situation, but just not in the futures market. Fundamentals give the reasons for taking a particular action, but they do not provide the critical element of timing. That has changed, at least temporarily, and reading developing market activity, our constant theme, has finally entered the limelight. We use price, volume, and time as the components for reading and timing the markets. Just as a reminder: technical aspects like moving averages, RSI, MACD, Bollinger Bands, etc., are not a consideration in reading market activity. They are artificial measures using past tense data imposed upon present tense price as a means to “predict” the future tense. We do not have any use for them. The market, itself, provides the best factual information available in order to read its intent. The most important piece of market information always starts with the trend. Gold is now beginning to show signs of a potential bottom. It is too soon to know for certain, at least on the monthly, and weekly charts. Absent a surprise “V-Bottom,” when price rallies like a sling-shot from the lows, it takes time for a bottom to develop, so one is not being declared, as such. Instead, the weekly chart is used for context, while the daily and intra day charts are more for timing. and volume strong, the resistance should give way. The daily chart below shows for the first time since price entered the 18 month TR, after the 2011 highs, that the daily trend is up. It may be short-lived, it may continue higher, we do not know how the next several days/weeks will develop, but we can say for certain, at least for now, there are reasons to trade from the long side. Noonan: Window of Opportunity to Buy Physical Gold & Silver Narrowing – Don’t Wait, Buy Now! After the mid-July absorption there was a strong breakout that stalled at obvious resistance. The market gave some important information in how price reacted. It was a labored decline in a market where prior declines were faster. The 11th day bottom was small with a close on the high and above the previous day close. That was the market telling us buyers had stopped sellers during what has been a very negative price environment. Note how price rallied with ease over the next 3 TDs, then a two-day “correction,” and it led to last Thursday’s breakout rally, slicing right through the resistance area. We use a 90 minute chart below to show how the market left numerous clues for taking action. 1 was a small TR that came from a very strong rally bar on equally strong volume. The fact that price consolidated, as opposed to correcting much lower, spoke to underlying strength coming off the lows. At 2, there is another strong, wide-range rally bar. Volume does not show because it was during overnight hours, but the rally continued right up to resistance. Price backed away and retraced to the highs at 1, and formed a failed probe, at 3….Price rallied back to resistance. It is not good practice to buy just below resistance, where price stopped there again, on the 14th. What happened at 4 developed very quickly, and one had to be prepared to recognize events as they were occurring and react to them just as quickly. From lock-and-load at 1 – 4, it was time to “fire” at 5. The spike down to the low at 4 was followed by an immediate rally back up on increased volume. That alerted us to a potential shakeout, where price drops to “shakeout” weak longs and stops, just before resuming higher. That this development was happening so near a resistance area was a message that gold was ready to move higher, according to information provided by the market itself. It was time to buy and buy now, if the read was accurate. The volume that day was important confirmation that demand had just overwhelmed supply. 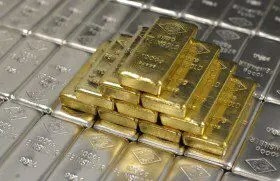 The knowledge of market manipulation and huge demand for physical gold provided background that this market was due for a rally, but almost all thought the rally should have happened weeks or months ago. Finally, the charts, in reading the market activity, gave the “when” to act, with a low-risk entry. The timing for that window of opportunity was about 10 minutes. This is why we love charts and tout them as the best and most reliable source for market information and the most important element, timing. That last bar on the weekly chart below speaks volumes, a gap higher from apparent weakness. The odds of silver retesting 26 have increased dramatically. We often mention putting developing market activity into a context as it is the vital step in preparation for when a market moves. The support-turned-into-resistance line is drawn as the market activity dictates, which most often is…simply a straight line, used for convenience and not necessarily accuracy. The lower support/resistance line meant very little as price sailed right through 21. It shows the importance of how price reacts to an anticipated resistance. Obviously, when it goes right through, the market is telling us to expect higher levels. Silver is already testing the higher resistance line, just above 23. The “D/S” designates Demand overcoming Supply, evidenced by the wide range up bar and on sharply higher volume. It could not be any clearer that demand, [buyers], took charge. 23+ may act as resistance but…volume and rally getting there suggests it could be short-lived. In the daily chart below you can see the day of the gap that was shown on the weekly chart. That was one of the market’s stronger messages, emphasized even more by the next two days, a consolidation in the form of a rally and not just sideways, as normally occurs. We recommended the long side in silver earlier based on a short-term read of developing market activity but the buy signal from last Thursday was a much better one. Noonan: Silver Charts Suggest This Could be the Bottom! Timing for buying silver last Thursday, just as with gold, was very short, and one had to respond on instinct and not sit back to assess the developing information. That “instinct” actually comes from the necessary preparation work and not simply “shooting from the hip.” As the steps were shown in gold, they existed for silver, but silver had been stronger from the “signs” indicated. It is not always this clear, but when the market “talks,” we listen. 1. Noonan: Window of Opportunity to Buy Physical Gold & Silver Narrowing – Don’t Wait, Buy Now! 5. Noonan: Silver Charts Suggest This Could be the Bottom! 6. Noonan: Charts Suggest NO Ending Price Action In Either Gold or Silver – Take a Look! 13. Spend Your Bernanke Bux Now on PHYSICAL Gold & Silver! Here’s Why! 14. Gold & Silver vs. Fiat: Do You Live In An Imaginary World Or In Reality? I expect to see far more “breakouts” in the near future and suspect we will also see some of them be “historic” in both their volume and their price shifts upward, especially with Silver!